Soya chunks (Meal maker) have protein content equal to meat and contains no fat. So it is good replacement for meat whose want to reduce their cholesterol level. We can make many dishes using Soya chunks.Today i'm going to share a good evening snack using Soya chunks. I preferred shallow fry rather than deep fry. Pressure cook the soya chunks for a whistle . After cool down squeeze the water and blend it in blender. Heat oil in pan, add mashed potato and minced soya chunks mix well. Add chilli powder , garam masala ,cumin seeds powder , Ginger garlic paste and salt mix every thing well and cook for 4-5 minutes. Cool down the mixture and divide into equal size balls. Make the balls into desire shape ,take one and dip in egg white and roll in bread crumbs. Repeat it for other portions also. 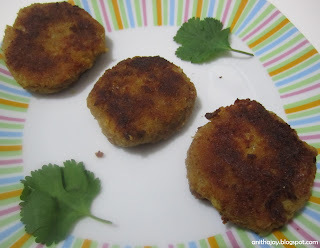 Heat Dosa pan or Tawa , add 1 tsp of oil and then add shaped patties . Cook well in both sides. Serve hot with Tomato ketchup or Coriander chutney. These look delicious and healthy too Anitha!